Sit N Go tournaments are quickly becoming the most popular form of poker, especially in the online poker community because of their expedient nature. 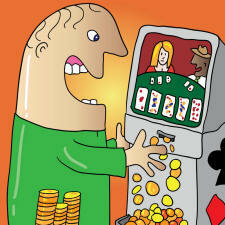 Poker players simply lack the patience to get through thousands of players to get to the payday. Enthusiasts no longer want to spend 12 hours or more of their day at the felt. Plus, with so few players involved, it becomes easier to visualize the ultimate goal - taking 1st place. In this article, we'll share 10 Sit N Go Tips that should help you achieve that goal. Choosing the right Sit N Go tournament is very important. Some SNGs are Single-Table events, while others may seat 3, 5, 9, or more tables of players. PokerStars offers some very lucrative 180 player sit n go tournaments. The more players there are, the higher the prize will be, and the more players that will finish in the money. However, more players' means more time invested. Consider how much time you have to dedicate to this Sit N Go before selecting a large event. Sit N Go Tip #2: What's Your Style? The tournament structure is also very important. Regular SNGs start with large chip stacks and slowly increasing blind levels, giving skilled players a strong advantage. Fast-paced tournaments, known as "turbos", start with much lower chip stacks and fast blind levels, leaving Lady Luck to decide the fate of most players. Be careful to choose your SNG based on the playing style that best suits your poker strategy. Your bankroll should also be factored into the decision. By using a proper Sit N Go poker strategy, you are likely to win at least 1 in 10 SNGs. Therefore, the general rule of thumb is never to enter a Sit N Go Tournament that costs more than 10% of your overall bankroll. This means if you have $150, don't choose a buy-in of more than $15. Learn more about bankroll management. Before taking to the felt, the number one goal any Sit N Go tournament player should aim for winning the tournament. Don't start out thinking, "Okay, let's try to make the money and avoid losing our buy-in!" Wrong. First place pays significantly more than second or third, so we always advocate playing to win, and if you don't make it, oh well. You are better off winning one sit and go than taking third place in two sit and go's. In the earliest stages of a Sit N Go, the first thing that will occur is the elimination of all the impatient opponents. I like to call this ‘Cleaning House', because it only takes a few minutes for this group to be dismissed to the rails. These are the players who push all-in on the first hand, figuring they will either double up for a big stack, or save the time and effort it would have taken to rack up a stack the usual way. You have two choices: Sit back and wait for the impatient to drop out, conserving your chips for the big boys - or - double up your stack early by calling their tactless push. It's generally a bad idea to call if there are already several callers in the mix. You also don't want to find yourself on the rails. Only call with a big hand and good position if two or less opponents remain. The next group to exit the tables will be the fish. These are the lousy poker players who wouldn't know a poker strategy if it came up and bit them on the nose. Fish are easily recognized as they will call just about any bet so long as it's not a push. They don't want to risk everything, but they can't resist seeing the flop if it's affordable. With a decent hand, call them back. You can easily use the fish to build your stack before the schools run dry. Because Sit N Go tournaments are so much shorter than the MTT variety, you can rely on the occasional monster hand to boost your chip stack. Instead, your observation skills will take precedence. Learn the tendencies of your opponents, and when you find yourself successfully predicting their behavior, take advantage of it. If you're making an effort to read your opponents, you can only assume they are doing the same to you. Put yourself in their shoes and try to read your own behavior, as they would see it. You don't want to become predictable, but if they think they can predict you, you can turn that to your advantage by altering your normal strategy now and again. Learn more about online poker tells. The blinds are now increasing to a sizeable amount, putting a great deal of pressure on the short stacks. They will be using a tight, Push or Fold poker strategy, as should you if you are one of them. This means Push All-In with premium hands. Anything else should be folded. For the bigger stacks, this presents an excellent opportunity to steal blinds. At this point, you're approaching the bubble, and should be very careful to ensure you're not eliminated just before reaching your goal. Steal blinds in position when the opportunity presents itself, but only play big hands otherwise. Learn How to Steal the Blinds. Once you burst the bubble, you can relax a little - only a little, though. You still want to win the Sit N Go, after all. Your strategy should depend on how many players remain. Generally speaking, the fewer players there are, the more hands you can play. What were once marginal hands become more valuable. In a Multi-Table Sit N Go, there may be a full table of players, in which case you'll want to stick to a tighter poker strategy. A full final table will usually dwindle to half very quickly as the short stacks drop like flies. With a monster hand, take their chips as they fall - otherwise, be conservative and get as close to the big money as you can.